How does the knight move? 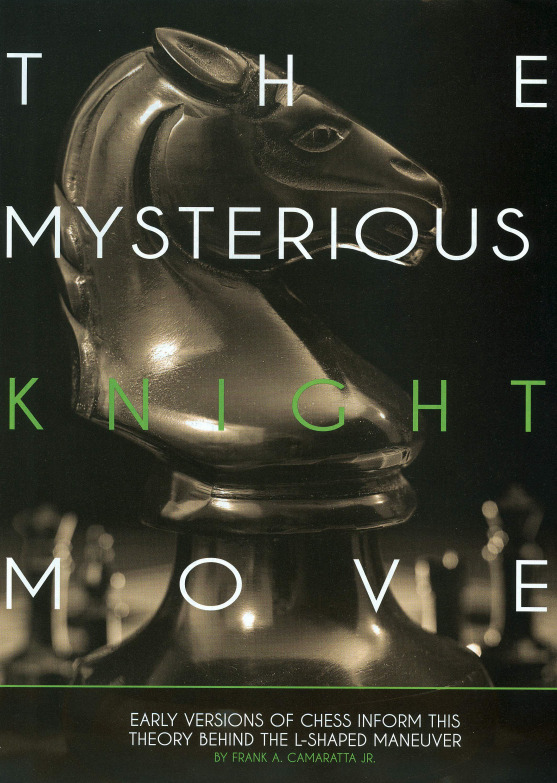 Or, rather, how can the knight’s move be described succinctly? Innumerable formulations have been proposed, but where is the ‘perfect’ definition? Readers are invited to try their hand, and for general guidance a sample of some of the old-timers’ efforts is offered. ‘The knights move obliquely, backward or forward, upon every third square, including that which they stood on, from black to white, and from white to black …’ Stratagems of Chess (1817), pages 3-4. ‘The knight moves obliquely, from the square it stands on to that of a different colour two squares distant.’ An Easy Introduction to the Game of Chess (1820), page 2. ‘The knight moves one square forward, backward or sideway; and finishes the move by proceeding one square diagonally; or, the knight may be moved at first one square diagonally, and then one square forward or sideway.’ A New Treatise on Chess by G. Walker (1833), page 3. 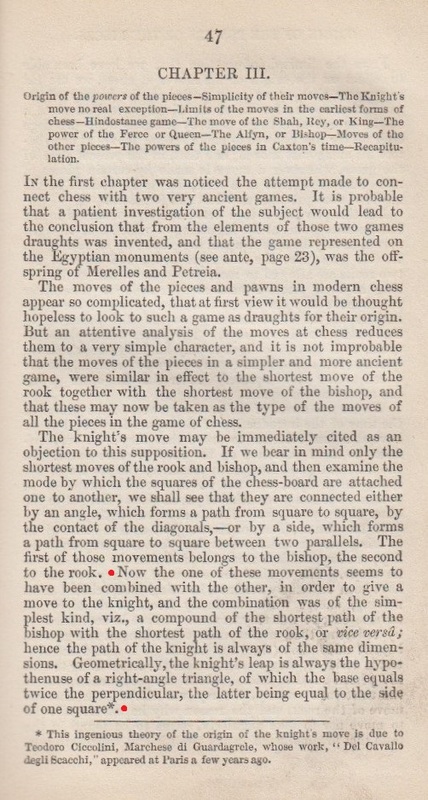 ‘The move of the knight consists of the shortest rook’s move and the shortest bishop’s move, both at once.’ Amusements in Chess by C. Tomlinson (1845), page 154. ‘When placed on any square towards the middle of the board, he cannot move to either of the eight squares which are contiguous to that on which he stands; but he may be played to any of an opposite colour to that which he then occupies, of the 16 squares which surround those eight.’ Introduction to The Chess Player’s Magazine (1846-47), page 8. ‘His move is one square in a straight line, and one in an oblique direction ...’ The Chess-Player’s Handbook by H. Staunton (1847), page 5. ‘It has a zigzag or oblique motion, leaping over an adjoining square to a square of a different colour from that from which it started.’ The Manual of Chess by C. Kenny (New York, 1859), pages 31-32. ‘The knights have a peculiar oblique move of their own. The knight can move over another piece three squares at a time; that is, he leaps from the square he stands on – passes over another – and rests on the third.’ A Handbook of Chess by G. F. Pardon (1860), pages 9-10. 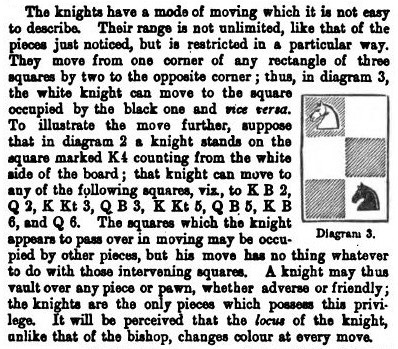 ‘The knight’s move is one square in a straight line, and one in an oblique direction.’ The ABC of Chess by A Lady (circa 1860), page 8. ‘The knight’s move is simply two squares of the rook’s move, and then one square at right angles, finishing on the last-mentioned, and having power over it alone.’ The Book of Chess by G.H. Selkirk (1868), page 27. ‘His leap carries him over one square in a straight line to one in an oblique direction. But this peculiarity will be better understood by an attentive study of the annexed diagram, and very much more readily by the tuition of some chess-playing acquaintance.’ The Laws and Practice of Chess by H. Staunton and R. Wormald (1876), page 36. ‘He moves or captures from the square where he stands to any third square of an opposite colour to the one from which he started, by skipping one diagonal square and then landing on the next square of the same line or row, or vice versa.’ The Modern Chess Instructor by W. Steinitz (1889), page xiv. ‘The knight may move in any direction to the square next but one of a different colour from that on which it stands; or in other words, may move horizontally or vertically in either direction, two squares forward and then one square to either right or left. … The knight’s move forms the diagonal of a parallelogram of three squares by two.’ Chess by R.F. Green (1889), pages 8-9. ‘The move is from a black square to a white, or from a white square to a black, round the corner, traversing one square diagonally to the next straightforwards; or one square straightforwards to the next diagonally.’ Chess for Beginners and the Beginnings of Chess by R.B. Swinton (1891), pages 11-12. ‘One move of the knight combines two king’s moves: one square straight, and one square diagonally to any but the adjoining squares to its starting-point.’ Chess by L. Hoffer (various editions, as from 1892). ‘The knight’s distance is limited to two squares, and his direction is intermediate between the rectangular one of the rook and the diagonal one of the bishop. … Mathematically considered, the knight’s move is in the diagonal of a rectangle of six squares or points …’ The Principles of Chess in Theory and Practice by J. Mason (various editions from 1894), page 9. ‘We now come to the knight, which radiates its force in the directions of obliques; and as the length of an oblique … is fixed and invariable, the magnitude of the force exerted by the knight in any one direction is also fixed and invariable: that is, the knight commands only one point in any one direction, that point being the final point of the oblique of which the position of the knight is the initial point.’ The Minor Tactics of Chess by F.K. Young and E.C. Howell (1895), page 31. ‘A square is said to be “commanded”… by a knight when that square and the square on which the knight stands are corner squares of a rectangle consisting of six squares in two rows of three each, such corner squares not being of the same rank or file.’ Everybody’s Guide to Chess and Draughts by H. Peachey (1896), page 16. 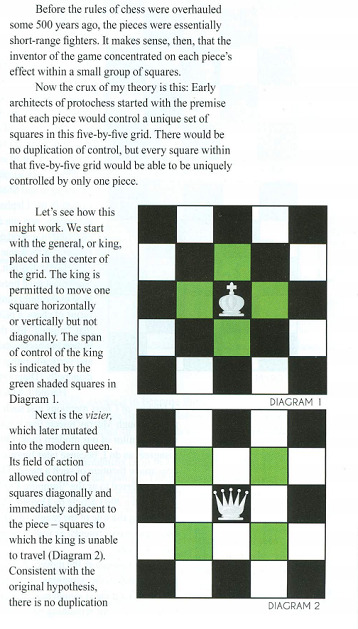 ‘The knight has a very peculiar movement, going always two squares along a row or file, and then changing the colour of the square he stands upon by going off at a right angle, one square to the right or left.’ Chess A Manual for Beginners by R.F. Foster (1897), page 23. 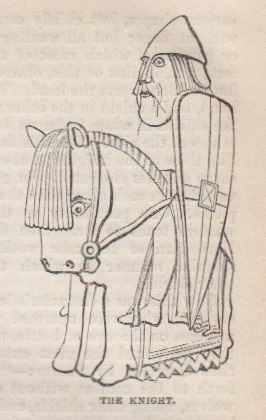 ‘The knight, whose movement differs materially from that of the other pieces, and who moves one square forward and one square obliquely, or one square obliquely and one square forward, combining the action of the rook and bishop, …’ The Chess-Player’s Manual by G.H.D. Gossip (edition revised by S. Lipschütz, 1902), page 8. ‘He changes the colour of his square every time. He moves two squares in a line with the one he is on and then one sideways.’ “Popular” Handbook of Chess by Professor de Lyons Pike (circa 1902), page 7. ‘It goes two squares in any direction upon rank or file, and then one square to right or left (upon rank or file).’ A Handbook of Chess by W. Chinn (1907), page 9. ‘One square, as a rook moves, then one square as a bishop (in any further direction); in moving he changes rank, file, diagonal, and colour of square.’ The Modern Chess Primer by E.E. Cunnington (seventh edition, 1913), page 9. ‘The knight moves in a peculiar way, viz., one square diagonally and then one square forwards, backwards or sideways, or vice versa, one square forwards or backwards or laterally and one square diagonally. His move combines the action of the shortest move of the bishop and the shortest move of the rook, or vice versa.’ The Complete Chess-Guide by F.J. Lee and G.H.D. Gossip (1914 edition), page 4. ‘He moves in a zig-zag, two squares one way and then one square to either side.’ Chess: An Easy Game by A.W. Foster and R.E. Kemp (1914), page 2. ‘The knight plays and captures alternately on white and black squares, and only reaches such squares as are nearest to him without being immediately adjacent; his move is as it were composed of two steps, one square in a straight line, and one in an oblique direction.’ Chess Strategy by Ed. Lasker (1915), page 2. ‘A square is commanded by … a knight, when that square and the square on which the knight is standing are as near to each other as, without being of the same rank or file or diagonal, it is possible for two squares to be.’ Revised draft of the American Chess Code (American Chess Bulletin, March 1917, page 53). ‘The knight does move two squares distant, but one is on the straight and one diagonal.’ Chess: Draughts: How to enjoy them by C. Platt (1933), page 21. ‘The knight can play upon any opposite-coloured square that is two squares away from him. There is an ingenious description of his powers which runs thus: consider him to be situated in one corner of a box of three squares by two squares. He can play into the opposite corner of this box.’ Chess for the Fun of It by B. Harley (1933), page 10. ‘The knight moves in an odd manner. 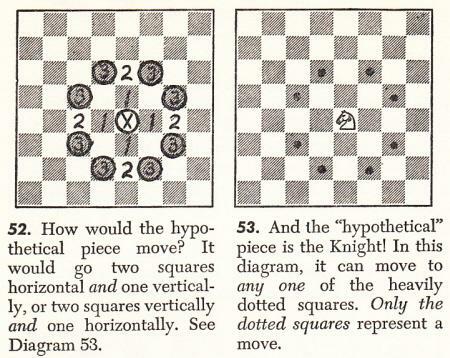 It moves one square vertically or horizontally and then one square diagonally.’ Jaffe’s Chess Primer by C. Jaffe (1937), page 15. On its own (i.e. without the example that Jaffe subsequently gave) this description would mean that a knight on g1 could move to g2. This drawback, which applies to various other definitions quoted here, was also pointed out by D.J. Morgan on page 136 of the May 1953 BCM. ‘Either he goes forward one square and then one square diagonally to the right or left, or he goes immediately to a diagonally right or left square and then forward one square.’ Chess in an Hour by F.J. Marshall (1937/1944), page 21. ‘The Knights draught is forward and backward on either hand aslope from the place he standeth in, to the next save one of another colour, skipping over any piece that standeth in his way; and in the same manner doth he guard, take, and check; which check, because (as the Pawnes check) it cannot be covered, the King must either remove out of check, or cause him to be taken, for he cannot take him himself, it is Check mate.’ The Royall Game of Chess-Play by G. Greco (1656), page 5. ‘The Knights (B and G) have a particular oblique Motion, from three squares to three squares, from White to Black, and from Black to White; and may leap over any intermediate pieces. 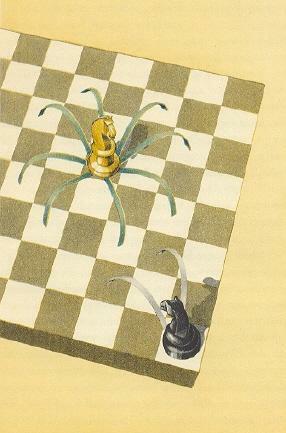 Thus G, or the King’s Knight, may move into E2, F3, or H3 if these Squares are empty, or filled with some Piece of the Adversary, which he may take by leaping into its Place, and removing it from the Board.’ Chess Made Easy by G. Greco (1750), pages viii-ix. 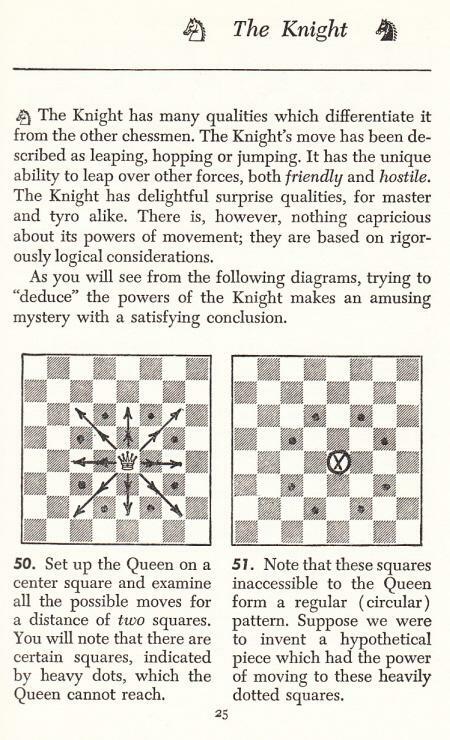 Have many other instructional works explained the knight’s move in this way, i.e. by reference to squares inaccessible to the queen? C.N. 8431 asked whether many instructional works had explained the knight’s move by reference to squares inaccessible to the queen, as did Learn Chess Fast! by S. Reshevsky and F. Reinfeld. Source: Page 11 of the original (Aylesbury, 1976) edition of Discovering Chess by R.C. Bell (‘R.C. Bell MB FRCS’). (a) one square “North” or “South”; then two squares “East” or “West”. 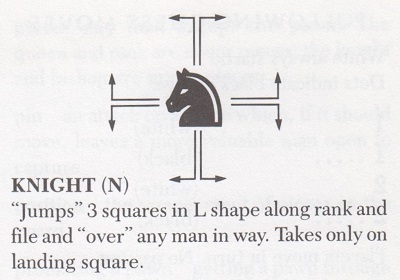 ‘The simplest way to consider the knight’s move is to imagine a three-square L-shape. The basic L-shape is achieved by moving the knight two squares in any direction and then one square to either side. Source: page 31 of Chess for Rookies by Craig Pritchett (London, 2009). Tomlinson’s text was originally published on page 191 of the Saturday Magazine, 13 November 1841. The text is on page 17 of the London, 1997 edition. Source: Chess Amateur, July 1912, page 673. Our correspondent furthermore draws attention to the definitions on pages 8-9 of A Guide to Fairy Chess by Anthony Dickins (Richmond, 1969 and New York, 1971). The first edition was published in Richmond in 1967. The article on chess, published in the mid-1870s, was signed ‘W.N.P.’, i.e. William Norwood Potter. His obituary on page 180 of the April 1895 BCM called it ‘masterly’; page 226 of the April 1895 Chess Monthly stated that Potter edited the article ‘together with Steinitz and Zukertort’.